The mallard is one of the most popular ducks of waterfowl hunters and birdwatchers alike. 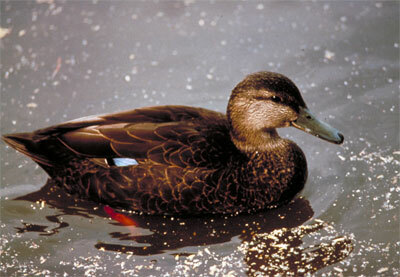 It's commonly seen in wetlands, ponds and lakes in rural areas and cities throughout Minnesota. General description: A large puddle duck that's most easily recognized by the male's glossy green head and white neck collar. Length: About 24 inches long. Weight: 2 1/2 to 3 pounds. 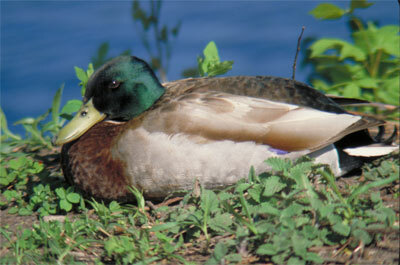 Color: Male mallards (drakes) have a glossy green head and white neck collar. Females (hens) are mostly brown. Males and young birds look like females in the summer. Both sexes have a blue patch on the wing. Sounds: Mallards are very vocal. Hens use a loud, long series of quacks; drakes have a low-pitched "wheat" call. In Minnesota, mallards mate in late winter or early spring. Nests are built in dense vegetation, and hens lay five to 14 eggs, which take 26 to 30 days to hatch. Newborns are covered with down; they begin to fly 49 to 60 days after they're hatched. Sedge seeds, grasses, smartweeds, aquatic plants and insects, corn, grains, snails and wild rice. Foxes, coyotes, skunks, mink and raptors. Lakes, marshes and flooded grain fields. Mallards range more widely than any other duck. They're found throughout the United States and Canada during the breeding season, and migrate to many southern states in the fall. They're also found in Africa and Asia, Europe, Australia, New Zealand and almost everywhere in between. The key to future mallard production is protecting wetlands and prairie grasslands throughout Canada, Minnesota and North and South Dakota. Mallards swim with their tail held above the water, so when trouble comes, they can spring directly out of the water and into the air.